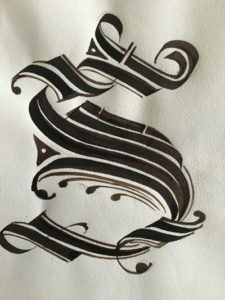 The Society for Calligraphy & Handwriting’s (SCH) next meeting is Thursday, January 17th, starting at 7:00 pm at our new location, Chinook Middle School, 2001 98th Ave NE Bellevue, WA 98004, in Room 1404. Please view our meetings page for a map and directions. Kathy Barker will be presenting Cadels. Originating in the 15th century, Cadels are beautifully decorated letters that are a delight to the eye yet deceptively simple to create. Kathy will present samples of both historic and contemporary Cadels. She will show us how to create some basic patterns. Please bring 6.0 and 3.8 Parallel pens (if you have them), tracing paper, mechanical pencil and an eraser. The supply fee is $3.00.